White paper on crime 2004 Part5/Chapter3/Section2/3. As mentioned above,foreign national prisoners have increased in number.Among foreign nationals who do not have Japanese nationality,some are domiciled in Japan with the status of permanent resident or special permanent resident,and others are only in Japan temporarily.Therefore,under the present Classification Treatment System,prisoners are not classified simply by nationality,but from a substantive perspective,"foreign nationals who need different treatment programs from those for Japanese"are classified into Class F and treated accordingly.Most Class F prisoners need special treatment,being either(1)prisoners who do not have an adequate command of Japanese,or(2)prisoners who have quite different manners and customs from Japanese. The following is an outline of the trends in the number and characteristics of Class F prisoners,followed by a description of problems and measures for their treatment. Fig. 5-3-2-21 shows the number of newly admitted Class F prisoners since1976,when statistical data became available. The number remained around100at most in the Showa Era(before1989),and as mentioned in1(4)in this section,most of them were nationals of South or North Korea who had taken root in Japanese society.In those days,there were few problems observed regarding foreign prisoners(see Fig. 5-3-2-4 ). It started to show an upward trend around1992,posting new highs every year since1997.It increased from78(78male)in1976to1,584(1,424males and160females)in2003,accounting for5.1%of the total31,355newly admitted prisoners. Fig. 5-3-2-22 shows the number of Class F prisoners staying in prisons at the end of each year since1989.The number increased from220in1989to3,010(2,793males and217females)in2003,accounting for4.9%of the total60,851convicted prisoners at the end of the year. 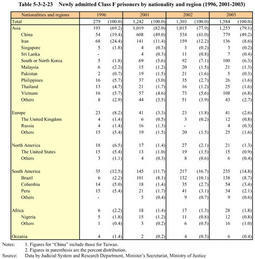 Table 5-3-2-23 shows the number of newly admitted Class F prisoners by nationality and region in the last three years and in1996,the first year that detailed statistics were available.Those with Asian nationalities have been consistently the largest in number,and those from China(including Taiwan,hereinafter the same in this paragraph)have accounted for40%to nearly50%in the last three years. In 2003,the largest number of Class F prisoners were(1)779Chinese(49.2%),followed by(2)138Brazilian(8.7%),(3)136Iranian(8.6%),(4)108Vietnamese(6.8%),and(5)100South or North Korean(6.3%).Brazilians and Vietnamese have increased significantly in recent years,and Brazilians increased to the second largest after Chinese in2003in particular,while it was the fourth largest after Chinese,Iranians,South or North Koreans in2000(Source:Data by Judicial System and Research Department,Minister's Secretariat,Ministry of Justice).Compared to1996,the increase in Chinese is extremely significant along with sharp increases in South or North Koreans,Vietnamese,and Brazilians. Fig. 5-3-2-24 shows the age distribution of newly admitted prisoners since1996,comparing Class F prisoners and other prisoners.Nearly80%of Class F prisoners are under40years old,and very few of them are60years old or over,showing no signs of aging. Fig. 5-3-2-25 shows the number of newly admitted Class F prisoners by major type of offense during the last20years.Stealing such as theft and robbery,and drug offenses such as Stimulant Drug Control Law violations and Narcotics Control Law violations dominate other offenses.Immigration Control Law violations have also increased since around1998. Fig. 5-3-2-26 shows the distribution of offense types committed by newly admitted prisoners in2003,comparing Class F prisoners and other prisoners.As observed in Fig. 5-3-2-26,the percentage of Immigration Control Law violations is high among Class F prisoners.Fig. 5-3-2-26shows the distribution excluding Immigration Control Law violations. Comparing Class F prisoners with other prisoners in Figures5-3-2-26and,the proportion of stealing is much higher among Class F prisoners since theft and robbery collectively accounted for55.8%of all offenses by Class F prisoners.In contrast,no significant differences are observed in homicide. Fig. 5-3-2-27 shows the percent distribution by offense type for newly admitted Class F Chinese,Brazilian,Iranian,Vietnamese,and South or North Korean prisoners who are large in number.Different characteristics are observed according to their nationalities.The percentage of stealing is high among Chinese,Brazilians and Vietnamese.However,most stealing cases committed by Vietnamese were theft and the percentage of robbery was extremely low,while robbery percentage was higher in Chinese(nearly20%)and in Brazilians(nearly50%).More than60%of offenses committed by Iranian prisoners were Stimulant Drug Control Law or Narcotics Control Law violations.The percentage of Immigration Control Law violations is high among South or North Korean prisoners. Among1,584newly admitted Class F prisoners in2003,1,581were sentenced to imprisonment with labor,and three were imprisonment without labor. Fig. 5-3-2-28 shows the percent distribution by imprisonment term(only with labor)of newly admitted prisoners,comparing Class F prisoners and other prisoners.The percentage of longer term is higher among Class F prisoners. As mentioned in the beginning,under the present Classification Treatment System,foreign nationals who need different treatment programs from Japanese are classified into Class F and treated accordingly.The main focuses of their treatment are(1)promoting communication with prison staff,(2)maintaining strict discipline,(3)keeping them from causing trouble with Japanese inmates,and(4)deepening their understanding of the society and people of Japan. Since1978,Fuchu Prison,Yokosuka Prison(both for males),and Tochigi Prison(for females)had been designated to accommodate Class F prisoners.With the rapid increase of Class F prisoners,many more prisons were added:Osaka Prison in1996,eight prisons(Sapporo,Kurobane,Yokohama,Nagoya,Kobe,Wakayama,Hiroshima,and Fukuoka Prison)in1998,seven prisons(Fukushima,Maebashi,Niigata,Kofu,Shizuoka,Kyoto,and Takamatsu Prison)in2001,two prisons(Kawagoe and Nara Juvenile Prison)in 2003,and two prisons(Kanazawa and Nagasaki Prison)in2004.At present,21prisons for males and two for females(Tochigi and Wakayama Prison)accommodate Class F prisoners(Source:Data by Correction Bureau,Ministry of Justice). Among 3,010 Class F prisoners as of the end of December2003,2,776(92.2%)were classified into Class A(offenders without an advanced criminal tendency)and234(7.8%)into Class B(offenders with an advanced criminal tendency).For reference,among other prisoners as of the same date,20,575(37.8%)were classified into Class A and33,818(62.2%)into Class B.
Furthermore,by treatment classification,most Class F prisoners are classified into Class G(inmates who need living guidance). The existing Prison Law has no special provisions for the treatment of foreign prisoners.However,it is impracticable and inappropriate to treat those prisoners with completely different languages,manners and customs,cultures,and lifestyles in the same way as Japanese prisoners.Prisons are taking various measures according to their characteristics in terms of language and everyday life in prisons. Language is the largest barrier in the treatment of Class F prisoners.Without communication with prison staff,correctional treatment cannot be promoted,and various inconveniences will occur in their everyday life. 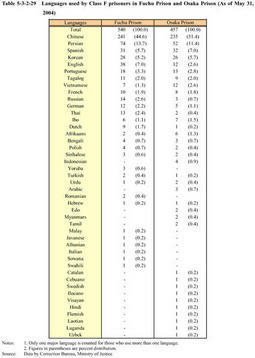 Table 5-3-2-29 shows the languages used by997Class F prisoners in Fuchu Prison(540persons)and in Osaka Prison(457persons)as of May31,2004.Twenty-nine different languages were used in Fuchu Prison,and36languages were used in Osaka Prison,indicating a significant diversification.The percentage of Chinese speaking prisoners was the highest(44.6%in Fuchu Prison and51.4%in Osaka Prison),but a considerable number of prisoners used minority languages. As one of the measures to bridge the language barrier with Class F prisoners,International Affairs Divisions were established in Fuchu Prison in1995and in Osaka Prison in1997.Professional staff for various languages in the Divisions are engaged in the treatment of Class F prisoners in their respective prisons,and are also providing assistance for interpretation/translation work for other prisons nationwide,or achieving coordination with foreign embassies. On the other hand,Japanese language lessons were also provided for Class F prisoners in22prisons as of May2004(Source:Data by Correction Bureau,Ministry of Justice).Their contents and methods vary in each prison,and some are using videos or computer-aided instruction to enhance the learning effect.Furthermore,prisons provide books and newspapers in foreign languages for Class F prisoners,and publish pamphlets to explain institution life in various languages.As of June2004,Fuchu Prison had more than28,000foreign books in37different languages(Source:Data by Correction Bureau,Ministry of Justice). Class F prisoners often have large differences in language,manners and customs,not only with Japanese prisoners but among Class F prisoners themselves.Some of them are from regions where serious ethnic or religious conflicts exist.In order to avoid troubles arising from these circumstances,prison cells or factories are assigned to Class F prisoners with great deliberation. Although they were once accommodated in one-person cells at night,recent prison overcrowding has made it impossible.As of May31,2004,among the540Class F prisoners in Fuchu Prison,"those accommodated in one-person cells day and night"came to56,"those in one-person cells at night"came to341,"those in one-person cells in pairs with another Class F prisoner"came to76,"those in associate cells with other non-Class F prisoners"came to64,and"those in one-person cells in pairs with another non-Class F prisoner"came to three(Source:Data by Correction Bureau,Ministry of Justice).Ordinary prison cells have tatami floors.However,for those Class F prisoners accustomed to chairs and beds,such furniture is provided in their cells. In assigning factories for prison work,concentrating Class F prisoners at specific factories is avoided.They are assigned to appropriate factories according to their vocational aptitude and motivation,together with other non-Class F prisoners.As of May31,2004,Class F prisoners were working in26out of27factories in Fuchu Prison(excluding nursing factories and prison maintenance workshops).One factory held a large number of38Class F prisoners among the total of105working prisoners. (Source:Data by Correction Bureau,Ministry of Justice).As mentioned in3(2)in this section,Class F prisoners are young,and their terms of imprisonment are relatively long.Some of them have become acquainted with prison work,and assigned important roles,or do work utilizing the advantage as foreign nationals such as making lists of foreign books. As many foreign prisoners are religious devotees,religious acts such as divine service are admitted and possession and use of the equipment for that purpose is also allowed,as long as they do not cause too much noise or hindrance to prison management.In Fuchu and Osaka Prison accommodating many Class F prisoners,the use of mats for Muslim prayer services is the most frequent,and a total of94prisoners used such mats(as of May31,2004,Source:Data by Correction Bureau,Ministry of Justice). Consideration is also given to their meals to whatever extent possible,according to their dietary habits and religious laws.In Fuchu Prison and Osaka Prison,special meals were provided to243out of997Class F prisoners,with meals without pork served to180,bread instead of rice to176,and vegetarian food to17(as of May31,2004;Source:Data by Correction Bureau,Ministry of Justice).Furthermore,during the Muslim month of Ramadan,mealtimes are changed accordingly. Fig. 5-3-2-31 shows the parole rate of Class F prisoners and other prisoners since1996,when data became available.The parole rate of Class F prisoners has been about90%,higher than that of other prisoners.Examining1,030Class F and14,243non-Class F prisoners who had been sentenced to imprisonment with labor and were granted parole in2003,the Class F prisoners were paroled after they had served70.6%of their sentenced terms in average,10.9points earlier than the non-Class F prisoners who were paroled after they served81.5%of their terms(Source:Data by Judicial System and Research Department,Minister's Secretariat,Ministry of Justice and Surveys by The Research and Training Institute of the Ministry of Justice). Class F prisoners have a higher parole rate and tend to be paroled earlier than other prisoners.This is partly because most of them may be deported from Japan after being paroled.As can be observed in Table 5-3-2-32 ,among3,480Class F prisoners as of the end of June,2004,2,909(95.7%)out of the3,040prisoners fell under reasons for deportation,according to immigration offices answers as to whether they have their deportation reasons.